Today was the second annual official International Rock-flipping Day, which I first mentioned back in this post. Dave at Via Negativa has begun collecting the posts by people who have participated and compiling them at this post on his blog. I headed out just after noon, after temperatures had warmed up a bit. Rocks are in no shortage at our house. I started with a few up by the house, not finding a whole lot. 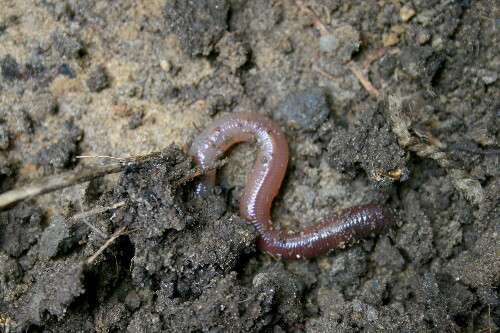 A few millipedes (which are everywhere, a couple earthworms, including one giant fat one, and a cricket. The most interesting thing under these rocks was what appeared to me to be a beetle larva of some sort. 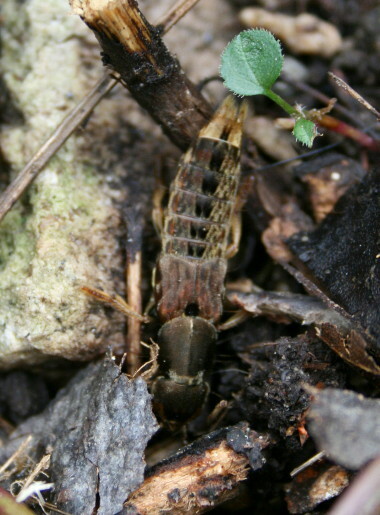 After flipping through the beetle section of the Kaufman guide to insects, I’ve changed my mind, and now think it’s a rove beetle, possibly Platydracus maculosus, a widely-distributed, decay-feeding, short-wing-covered (but deceptively long-winged) beetle. I love the woodgrain patterns in it. I headed down the hill, flipping a couple rocks in the forest. I expected a bit more from the forest rocks, since the forest always seems like such a rich habitat. 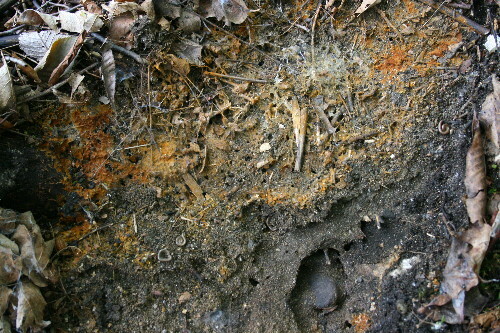 You’d think there’d be lots of stuff munching on the deliciously rich detritus layer of the forest floor. 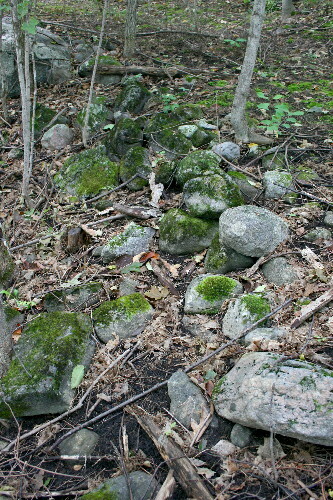 But the rocks in the forest area were decidedly empty. The only really interesting thing was the below… white thing. 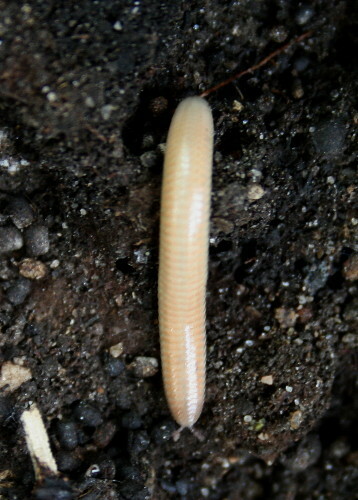 It looked like it was probably a type of millipede, but it was very pale, paler than any millipede I’d ever seen. 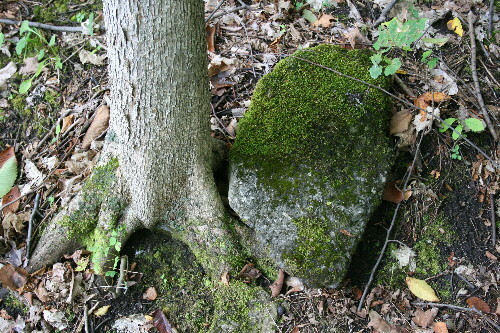 I carried on and found this promising looking rock, above, sitting beside the base of a tree, near the forest edge and not far from the water. Indeed, when I flipped it over it had much more under it than any of the rocks I’d checked to that point. First thing I saw as a largeish spider, mouse brown with interesting darker markings. Again, no idea what it was. You know, the primary thing I learned about this whole exercise was how little I knew about most invertebrates. Particularly the rock-dwelling sort. In there with the spider was the above slug. 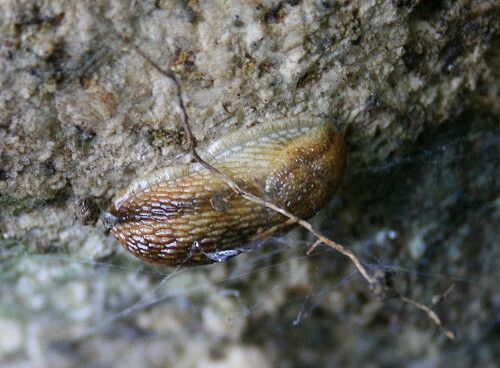 Apparently there are several types of slugs, and many of the most common ones are introduced. Who knew? This could be an introduced slug. It could also be a perfectly natural native slug. I have no idea. My guidebooks don’t do slugs. The most interesting thing under that rock wasn’t the spider or slug, but rather what looked a bit like a fungal garden of an ant colony. Aside from the fact that I didn’t see any ants, except one that ducked into the large hole in the ground. But all the tunnels that weaved in and out of the surface were suggestive of an ant colony, and the fungus looked like it was associated with it. It could have been complete coincidence, of course. Either way, it was an interesting rusty colour. The best was saved for last. 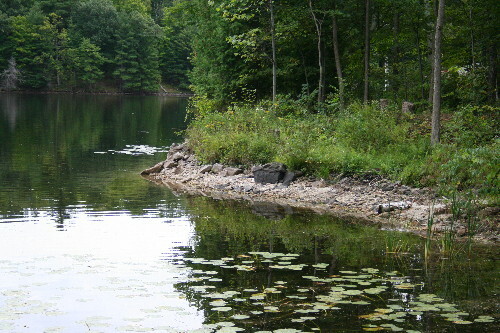 I ended up at the edge of the lake, where a portion of our shoreline is built up with large rocks. I flipped a couple of small ones, with no notable findings, before landing on a nice large, flat slab, resting on a sandy base. The treasure trove, such as it was, laid under here. Although I’d seen a couple others under earlier rocks, there was a nice big, grey isopod under this rock. Which sat there quite obligingly, not something most will do for me. These aren’t insects, but rather are crustaceans. They like damp places, so are often found in basements or bathrooms as well. I bet you didn’t know that the extremely common pillbugs (without tails), and sowbugs (with two “tails”) such as the above, are all introduced from the Old World. This beetle went scurrying before I could get a good picture. Darkling beetle of some sort, maybe? 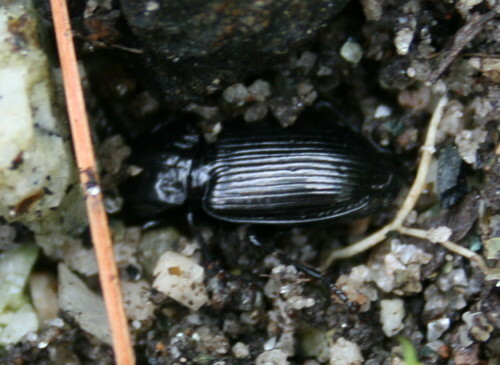 Or possibly a ground beetle such as Pterostichus sp.? It’s too bad I didn’t get a better photo, but then – I’m not sure it would’ve done me a whole lot of good anyway. There are so many beetles (Kaufman dedicates 90 pages to the group) and I don’t know enough about them to be able to differentiate between species that have similar shape and colouration. Likewise, I didn’t get the best photo of this one, either. They move so fast! And you’re hoisting the rock up with one hand while scrambling to get the camera positioned with the other. I thought at first the shape of this one suggested tiger beetle, but I don’t think the head is big enough, and it doesn’t have spots. Now I’m thinking a type of ground beetle (it helps that it was fittingly found on the ground), perhaps an Agonum sp. 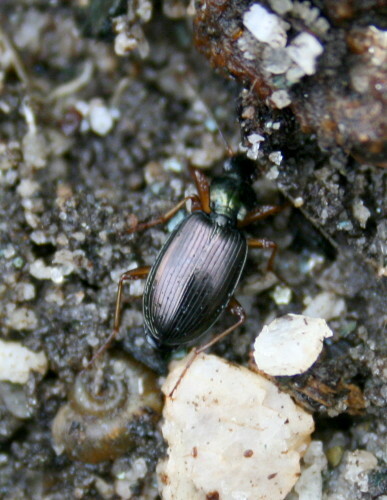 such as Agonum cupripenne? This one has the look of iridescent-purple wing covers and an iridescent-green thorax, which the A. cupripenne images on BugGuide.net show. However, there are over 50 species in this genus in the northeast. And lastly, my favourite bug of the whole outing. Also scurrying for cover, its wing covers spattered with droplets of water. Rain, perhaps, since it was raining lightly, briefly, before I stepped out. I’m fairly confident in calling this one a Bombardier Beetle, of the genus Brachinus. 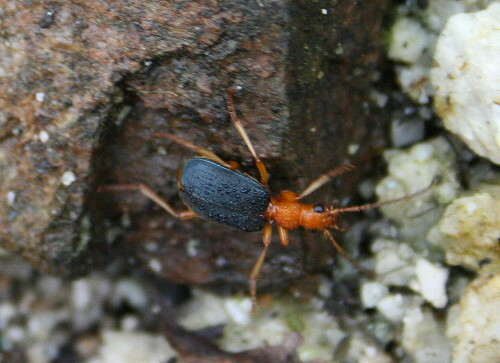 The members of this genus have the fascinating ability to spurt boiling hot liquid chemical from its abdomen, scalding the potential predator so the beetle can make its escape. It accomplishes this by combining two liquids (hydrogen peroxide and hydroquinone), contained in separate compartments in its abdomen, as it shoots them out at the threat. The liquids undergo a chemical reaction with the aid of a catalytic enzyme (an enzyme that acts to initiate or speed up the reaction), and rapidly reach a temperature of 100oC (212oF). In addition to scalding the skin, the chemicals can also stain it yellow. The species in this genus all look very similar – black wing covers, orange thorax and head – such that I have no idea which particular species this is. There’s 40 to 50 species in North America, usually found under things, like rocks, in damp areas at the edges of floodplains or water bodies. And that wraps up IRFD 2008. Don’t forget to check out the official page for other posts! You found some great stuff….and I LOVE that spider. It looks so succulent! You can tell we were both referencing the Kaufman guide because we practically wrote the same thing about Sow/Pillbugs. Funny! You have some wonderful photos. Wow, what a great bunch of finds! 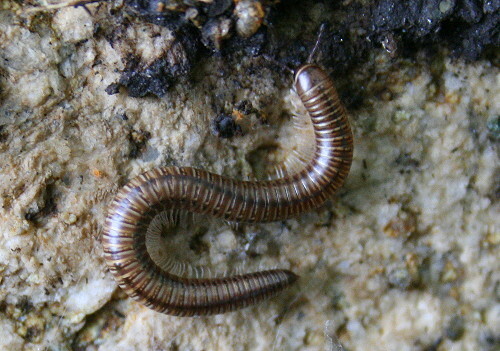 I love the white millipede. And yeah, if Rock-Flipping Day were to have one, central lesson, it ought to be how little we know about the things that live under rocks and in other inconspicous spots all around us (and by “we,” I mean scientists, too). Wow – you had lots of great finds on IRFD! Amazing variety, and some real beauties; I’m especially partial to the beetles. I missed this day, didn’t know it existed, but I’m happy to admit that I do this flipping a lot! Love the photos. Sorry to sound nerdy, but what lens are you using? Looks like a great haul. I’m embarrassed I didn’t flip any rocks yesterday. Lovely group of photos. Thank you. Pingback: Rock Flipping Day at Horsetail « Let’s Paint Nature! Oooh – you got some good stuff! Yea, it is sad how little I know about the critters under the rocks in my own yard. 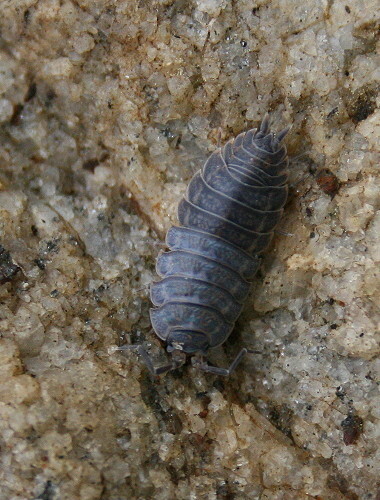 At least, I have learned the difference between pillbugs and sowbugs courtesy of IRFD. From now on, I’m going to be wary of any blue-black beetles sporting orange T-shirts. I had seen in your blog awhile back tha IRFD was approaching, but didn’t write down the date. On September 5 I flipped a few decaying barn boards and found an ants’ nest, some centipedes, a number of large slugs, and a little garter snake. On September 7 I was at Stratford, watching Julius Caesar (Christopher Plummer!) flip over Cleopatra as they sat on the stone paws of the Sphinx — does that count? Thanks, everyone, for swinging by to check out my IRFD post! I am a spider ecologist, and although it’s over 1.5 years after-the-fact, I thought I’d help you out with an ID. 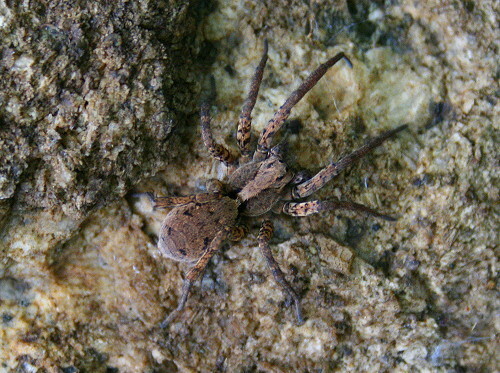 The spider you found under your rock is a lovely female Wolf Spider. There are 200+ species of Wolf Spiders in N. America, so we’ll leave it at that. They have great vision (as opposed to most spiders) and are active hunters that do not build webs to catch prey. This is the type of spider you might see in Springtime running around with an eggsac attached to her bum, or after the eggs hatch, tiny baby spiders hitching a ride on mom’s back. Nice photo of a pretty spider. Thanks for sharing superb informations. Your web site is very cool. I’m impressed by the details that youˇve on this blog. It reveals how nicely you perceive this subject. Bookmarked this website page, will come back for extra articles. You, my pal, ROCK! I found just the information I already searched everywhere and just could not come across. What a great web site.